Work Station Fans mount with one bolt or lag screw to walls, ceilings, work benches, machines or any surface. These Work Station Fans are three speed, 115V, 1 phase, ball bearing, permanently lubricated fans. 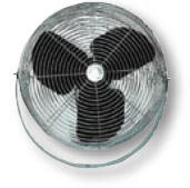 These fans feature a pull chain switch with a 10 foot long cord and an SJT type 3 conductor. Meets OSHA standards and is UL listed. Available in Wall and Floor options with 18" Blade Diameter, and Wall option with 12" Blade Diameter.